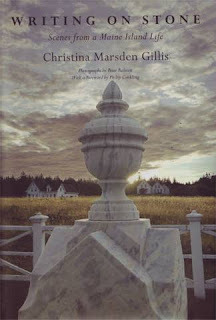 Christina Gillis will read from her new book: Writing On Stone - Scenes from A Maine Island Life at Gulf of Maine Books on Saturday, August 9, at 4 PM. "My picture of Gott's Island has been a mytho-poetic one, informed by the novels of Ruth Moore. Christina Gillis roots that vision in rock, pulls you down to the stone and sea, and builds an accurate picture of the island through thoughtful story and perceptive listening, watching and telling. She takes you there, and you begin to feel at home." Gary Lawless. OK, so I wrote the blurb, have been to the house where she lives on Gotts island, the house where Ruth Moore's family lived a century ago, where Ruth Moore was born, but this is really Christina's story, and the island's story. The book was co-published by the University Press of New England and the Island Institute, with photos by Peter Ralston, and an introduction by Philip Conkling. Please come listen to this voice from Gott's Island!